The Phoenix One, RoadTrip America®'s original mission control center and home to Mark, Megan & Marvin the Road Dog, is 32 feet long, 12 feet high, 8 feet wide and weighs 7½ tons. With four-wheel drive, high clearance, and a winch on the front to get us out of trouble, it's able to go places ordinary motor homes just can't. Built in 1994 by Revcon Motorcoach, Inc., the Phoenix One has a Ford F-350 chassis with crew cab. The rear "tag" axle provides support for the extra weight of the coach. Inside, the Phoenix is equipped with two computers, fax & copy machine, two cellular phones, and enough amenities to make it a home. It all fits into 200 square feet, which sounds small until you remember that its backyard is 3,000 miles wide. Want to take a virtual tour of this unusual exploring machine? Click here to look at the galley & living quarters, and here to look at the office. If you have any questions or comments, please don't hesitate to write. 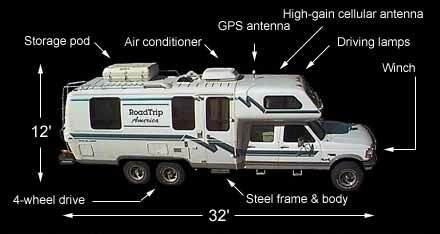 Are you shopping for an RV? The RV Net and RVIA (Recreational Vehicle Industry Association) Web sites offer some helpful resources. If you're looking for parts, equipment and components that you can't find anywhere else, click here to check RV Net's "Obsolete Parts" listings.